By default OpenCart is set to use the default PHP mail function to send all emails generated by your web store. Sometimes this might be a problem especially if you host your OpenCart store on a shared hosting server. Due to the fact that the shared hosting server hostname is most probably different than your domain name the email sent via your OpenCart might have poor reputation due to hostname mismatch. In case you would like to improve your OpenCart mail delivery or if you prefer to use a third party mail service provider for your outgoing mails you will need to configure your OpenCart to use SMTP service instead of the default mail function. To do so, please login into your OpenCart admin dashboard and navigate to the System>Settings menu. From the store list click on the Edit link next to the name of the store you would like to configure with SMTP. From the store settings page, please refer to the Mail tab from the tab navigation menu. In this section you should change the Mail Protocol from Mail to SMTP by selecting the SMTP option from the drop down menu. When the SMTP is selected we need to configure our SMTP settings so your OpenCart application can authenticate properly. You have to fill in your SMTP Host, SMTP User, Pass and the SMTP port. In case you are hosting your OpenCart application with us, please use your domain name as SMTP host, your email account and password as SMTP authentication credentials. You may leave the SMTP port to 25 as this is the default SMTP port. 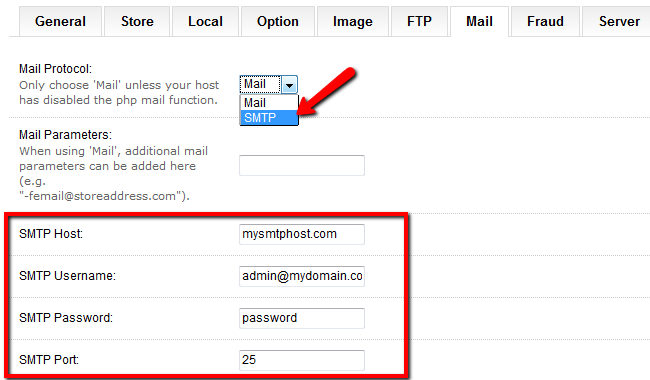 In case you are not sure what are your SMTP settings, please contact your mail service provider for the exact settings.